Get started with a themed box set! Small box sets are a step up from some of the starter packs. 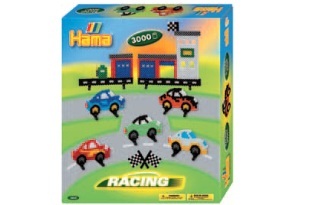 You’ll get between 2000 and 3000 beads, upto 2 peg boards and upto 14 board supports. Each themed pack such as Pirates and Princesses comes with easy to follow instructions. Contents: Approx. 3,000 beads, 1 large pegboard, 10 bead supports, colour printed design sheet, instructions and ironing paper Buy! Contents: Approx. 3,000 beads, 2 pegboards, 8 bead supports, colour printed design sheet, instructions and ironing paper Buy! Contents: Approx. 3,000 beads, 1 large pegboard, 12 bead supports, colour printed design sheet, instructions and ironing paper Buy! Contents: Approx. 2,000 glow in the dark beads, 2 pegboards, colour printed design sheet, instructions and ironing paper Buy! Contents: Approx. 3,000 beads, 2 pegboards, 4 bead supports, colour printed design sheet, instructions and ironing paper Buy! Contents: Approx. 3,000 beads, 2 pegboards, 14 bead supports, colour printed design sheet, instructions and ironing paper Buy!